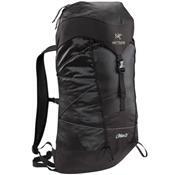 Strap the Arc'teryx Cierzo 25 Backpack onto your back when you need a streamlined, lightweight pack that can go anywhere. The compressible, minimalist design means you can stuff your Cierzo pack into the lid pocket and then bust it out for day treks or that final push to the summit. The ultra-high tech materials deliver cutting-edge performance in just about any conditions.